Back in 1989, I played an NES game called Dragon Warrior, which I really liked a great deal. At the time, "Japanese Role-Playing Game" didn't mean anything to me, but the concept of killing monsters with swords and spells was plenty familiar. Even though I completed the game, I seriously don't have any memory of it. I didn't play any of the subsequent sequels on the NES, either. Funny story: in high school, my friends and I had this habit of completing games, then using a shrink wrap machine to seal the games up again to return them for a new game. Moral ramifications aside, this was a very successful scheme with a healthy return rate. In the case of Dragon Warrior, I forgot to erase my game saves before returning the game. We had a laugh, thinking about the kid who bought my game, completed it in a hour, and the parents who get really annoyed as a result. I'm not proud of it, but there you go. It wasn't until 2005 that I got my hands on a demo disc for Dragon Quest VIII: Journey of the Cursed King. I knew very little about the game. I'm not even sure how I got the demo disc. It might have been included in a magazine bundle? Who knows. Being a Toriyama fan, I liked the cover art but otherwise had virtually no interest in the title. Nevertheless, I gave it a spin. I was immediately hooked by its charming story, incredible visuals, and addictive old school battle system. To be honest, I don't think I had touched a "traditional" Japanese role-playing game since the original Dragon Warrior! But playing the DQ VIII demo was like a revelation to me, sparking a renewed interest in role-playing games that continues to this day. Of course, I ended up buying the proper release and playing through it over the course of several months. Eventually, I logged close to 100 hours on the game, easily the most time I have ever put into a single title(Unreal Tournament matches notwithstanding). For the record, Dragon Quest VIII currently ranks as my second-favorite game of all-time. Essentially, it comes down to the characters. 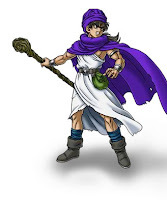 Dragon Quest IV is called "Chapters of the Chosen" because the game unfolds in -- duh -- chapters. And in each chapter, you take control of a different lead character or characters. Eventually, as expected, the final chapter culminates in all of these characters uniting in one party under the direction of Your Dude, the Hero. I thoroughly enjoyed this method of storytelling. It was fun how each chapter focused on a different area of the world and a different perspective of the main story. The only trouble was that every chapter began with a requisite "leveling up" period, which was somewhat tiresome. 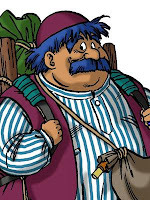 But the characters of DQ V are just as charming as the characters in DQ VIII, which is an impressive feat considering they do not have the benefit of funny animations or voice acting. Comparably, DQ V introduces the "Monster Hunter" mechanic to the Dragon Quest games, now a staple of the series (it even has its own spinoff series, Dragon Quest Monsters). While I enjoyed the monster hunting, I simply could not identify as easily with monster party members, and the way the game is constructed, you almost always have a monster or two in your party throughout the game. (Apologies to Clayton, my trusty mudraker. A puddle of goo is just not as interesting as a fat merchant with a giant moustache.) In fact, I defeated the final boss with a Great Dragon in my party, because of his resistance to fire. It would have been cooler if I could have completed the game with my wife and kids. And that is where Dragon Quest V really shines: its story of a family. You begin the game as a child, and end the game as a father. In between, your life unfolds in a way that is relatively unique in the world of RPG adventures. (Link growing up in some of the Zelda games is the closest comparison I can think of.) But DQ V stumbles as it relates to some of its mechanics: on more than one occasion, I had no idea what to do or where to go, requiring the help of an online FAQ to get me pointed in the right direction. This was not the case with DQ IV -- that game progressed much more smoothly and intuitively. This may be due to the fact that it is broken up into chapters, or discrete chunks. But I think it was just paced better, and a lot less frustrating. DQ V seemed to feature more moments where I felt terribly underpowered, many times forced to bring along high-level monsters (instead of members of my own family) to progress. DQ IV, on the other hand, has a more forgiving difficulty curve and was just more fun to play in general, at least for me. While both games are superb, I give the nod to Chapters of the Chosen. However, nothing beats Dragon Quest VIII. That is, until DQ IX comes out for the DS. Will it be awesome? Probably. It releases in Japan later this year, and it looks stunning. I suppose DQ VI will come out in the states first, completing the "Zenithia Trilogy" before continuing the franchise in the ninth installment. (That would be best.) And let's not forget about Dragon Quest X, announced exclusively for the Wii. That's a lot of Dragon Quest to look forward to! On a side note, when I visited Japan I bought a set of two Dragon Quest art books, which are just beautiful. The only image I could find on the web is here. The first volume is a collection of artwork of ALL the monsters from the first six Dragon Quest games (amazing), and the second volume is a bunch of stats in Japanese (not as amazing, but still cool). If you are a fan, pick these up if you ever see them! You will not be disappointed.